The Canterbury Tales Visitor Attraction is launching a new workshop to coincide with its education day this autumn. 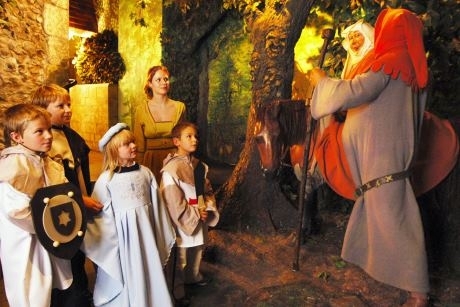 Top Canterbury attractions will be hosting a one-off education day on 20th September for schools, featuring the new permanent Chaucer themed workshop at the Canterbury Tales Visitor Attraction, as well as a variety of activities at other locations. The brand new City Trail and Canterbury Tales Visitor Attraction KS2 workshop has been created for the education day but will become a permanent part of the attraction’s education offering. School groups will be taken on a fully guided tour of the Canterbury Tales Visitor Attraction and further locations linked to Chaucer. Designed to be more interactive than before, students are encouraged to read a script aloud and get actively involved in the storytelling. The workshop activities have been developed to complement the KS2 curriculum subjects History, Religion, Literacy and Drama. The Canterbury Tales Visitor Attraction runs a number of workshops throughout the year including Medieval Survival, Business Talks and Campfire Tales, all of which have curriculum links. All school group sizes can be accommodated, and a costumed guide can greet you from the coach drop off. A visit is suitable for Key Stage 2 and 3 groups and downloadable resources such as activity sheets can be found on the website to aid a visit. The day will include four activities per class, maps of the key locations, class itineraries, costumed staff, a lunch marquee and special safety wristbands. Pupils will enjoy a tour of the city, discovering Medieval locations. Explore the Westgate Towers, England’s largest surviving Medieval Gateway and visit Canterbury Christchurch University, St Augustine's Abbey and The Beaney House of Art and Knowledge, among other locations. For more information, visit www.canterburytales.org.uk.